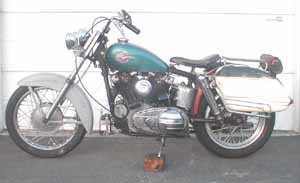 Build custom struts to mount antique Buco saddlebags on an old Sportster. Youngsters might make fun of baggers, but the older you get, the more you love saddlebags. If you want to make your motorcycle prime or central transportation, you need to carry groceries every week. 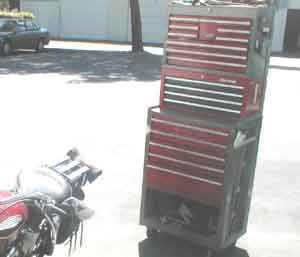 The other nice things about saddlebags is you can carry a few tools, and maybe some brake fluid or even a quart of oil. I carry a few of those plastic-laminated maps as well. Bah humbug on GPS. 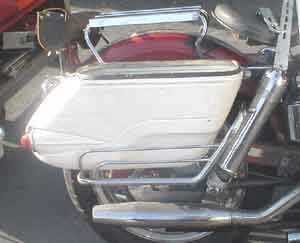 Leather saddlebags are OK, I have them on a couple bikes, but hard bags seem so much nicer. I have had to sew seams on old leather bags, no such problem with these. 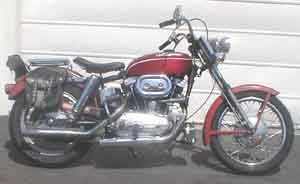 This is my '62 Sportster. Since I use my bikes for daily transportation I need saddlebags for all the various "stuff" of modern life. You can see the tiny leather bags I was sporting. They would just barely hold the mail from my PO Box. They were good in that they didn't overwhelm the bikes attributes. On the other hand, they did nothing special to enhance the bike either. My friend Karen was given a set of old Buco aftermarket hard bags by a friend. She wouldn't part with her's but in a modern miracle, I found a set on e-Bay the same day I saw hers. If you want professional results act like a professional. Bring the tools to the bike or vice-versa. Why do you think they call it a "roll around" anyway? You should make every effort to "work out of the box" which means you replace tools right after using them. That way you'll know where to find it as opposed to sitting in a little pile of tools scattered all around you like 5 year old in a sandbox. Leaving a 120-dollar Snap-On wrench in the cowl area of a customer's car cured me of leaving tools laying around. I would watch the big dollar Porsche mechanics on the other side of the shop. They put every tool back immediately after they used it. I said "But your going to use it two seconds later". Tim said "Yep, and I know right where it will be." First thing is to get the old bags off. They are captivated by the luggage rack so I need to whip off the ultra-cool bungee-nuts to get the rack up far enough to get the old bags out. "Cogitatin' and Calculatin" takes far longer then the cutting and sawing and welding. The bags came with mounts that were for a 60's vintage Honda Dream. You should consider if you can adapt the old mounts in some way. A pair of these brackets came with the old mounts and I am noticing how they would space the bags out just about right to clear the chain-guard. I never did use them though. I couldn't use either of the existing mounting holes. I need to move the bags an inch and a half forward for two reasons: 1) they would look better snuggled up against the shocks. 2) The inch-and-a-half would move the bag to where the forward bolt in the strut would go through the flat part at the front of the bag. It would still miss the little metal reinforcing plate. A nice profile view of the bag. It was an inexpensive aftermarket bag in the 60's but I think that it looks really cool with the art-deco styling. The twin taillights are another bonus, especially to a guy like me with a broken collarbone from being hit from behind while stopped at a light. About this time I had got it-- "The Inspiration". 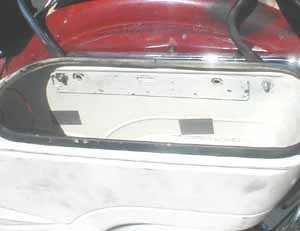 I figured I wanted space the bags out 2 inches from the fender struts and have the holes line up with the strut holes so the same bolts went through the fender, strut and saddlebags. Very satisfying from a structural and safety point of view. The inspiration was to go into my parts stash and get a couple used, beat up struts to cut up and mount to the bag. Then I could weld the strap you see to the strut to mount the crash bar that goes around the bag. 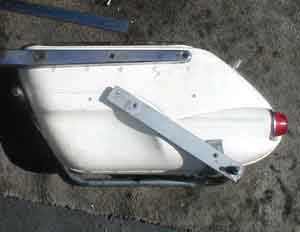 The flat strap came with the bags and was part of the original mounting to the Honda. I ended up trashing it and using another piece of strut. With the strut as a template it was easy to mark the holes. In retrospect I should have moved them down a quarter of an inch to make the internal backing plate i made fit better. 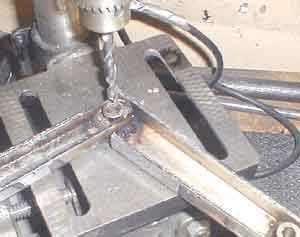 I am drilling a pilot hole with a smaller drill. I than follow with the 5/16 drill. You can see the forward hole is already done. Here we see the bag mounted with it's new holes. I checked out that there would be room for the crash bar between the shock and the bag and that the chain-guard would clear the bag even when the swing arm was fully up from a heavy load or a big bump. You can see the front bolt misses the reinforcing plate but we'll fix that in a bit. Time to make the left bag like the right one. It's pretty easy to match the two sides up when you lay them out opening-to-opening. 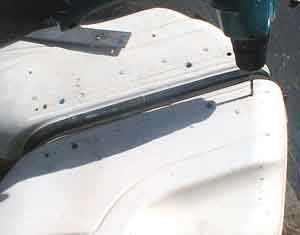 Same deal-- a small pilot hole that you can keep on location as you drill followed by a 5/16 slow and gentle to not rip up the fiberglass. With the bags all eyeballed and in proper position it's time for the hard work-- cutting up the struts. 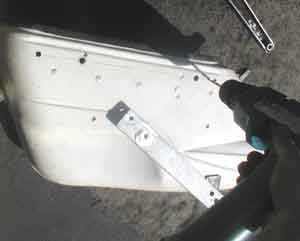 I am sawing it off well before the forward fender bolt hole where the bag will mount. You'll see why in a minute. The strut is just starting to bend up (outward when on the bike) where I am cutting it so the piece I will be left with will be straight. Same as with the bags, it's easier to make the other side at the same time. Using the first one as a measuring stick I cut the second one to the identical length. Note the rust and chrome peeling around bolt holes. This is a perfect use for these bars-- they aren't pretty enough to run but no one will see the rust where I will mount them. Now for the nice touch and the explanation of why I cut the struts longer then needed. 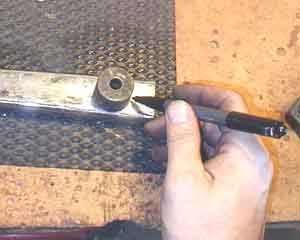 I found a big spacer about the right size to draw a semicircle around the forward bolt hole. This is the nice round shape I want the strut to have in the front. 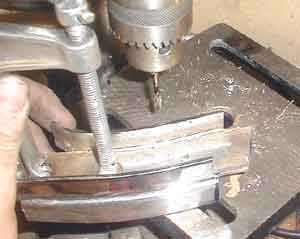 Now take the struts over to the trusty Jet Taiwan bandsaw and cut up the semicircle but do not cut all the way through the flange. 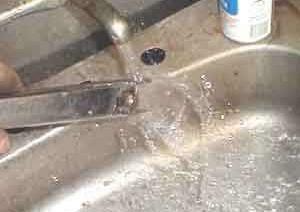 Stop when the blade hits the flange. Cut the triangle out leaving the flange intact. The other side of the semicircle being cut out. 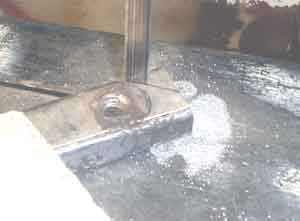 The trusty Jet Taiwan bandsaw comes into play again as you cut the triangle out, leaving the flange intact. 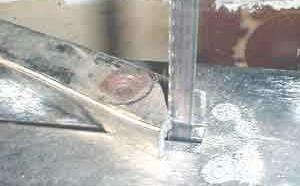 You can barley see the first flange because it is reflecting the bandsaw surface but it's there. 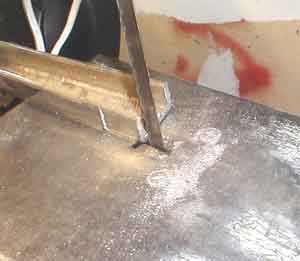 A bandsaw is a faster way to remove metal then grinding or sanding or even milling. Use it wherever possible. Here I am taking another pass at the piece that has to be removed to get the semicircular shape we need. After this cut I flip it around and take another cut to get even closer to the semicircle. You could use a 39-dollar sabre or jigsaw if you have no bandsaw. 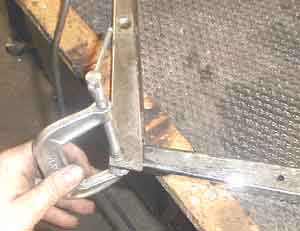 The right-angle grinder takes off the last bit of metal to get a perfect semicircle. 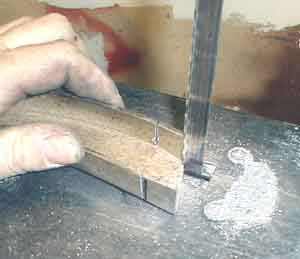 The bandsaw was especially useful to cut right down to where the semicircle meets the side flange. Po folk can use a file. Don't despair, it builds character and creates the lust for power tools that makes you a good American. See, I'm po' too. A file is used to get that semicircle perfect. Like painting a car or house, the preparation really pays off. 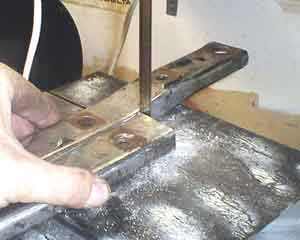 It's just as important to grind or file the side flanges flat and true, which is what I am doing here. I keep the welding bench and the bandsaw right next to the sink. Constantly cool the parts off-- you will burn yourself and burns on your fingers are a real handicap. I prefer to not use gloves when I work because my first co-op job at General Motors was in the safety department. They had a rule: No gloves around rotating machinery. The old timers loved freaking out the new kid by letting me look through the file photos. One was of a thumb hanging from a drill press chuck. The tendon wound up spindle for an especially gruesome effect. The guy had gloves on and was in a hurry. 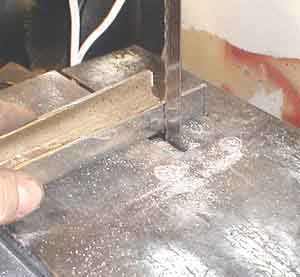 He had turned off the drill and grabbed the chuck to slow it down (like I do all the time). This chuck had a couple little square Allen head set-screws. If he was not wearing gloves he would just have gotten a minor laceration. As it was, the set-screw had the glove to dig into and his thumb got ripped off. I don't even wear gloves when I weld, which is equally stupid. At least it keeps me in the habit of cooling off the parts every time. I tried hammering over the flange cold and it didn't bend right. With a torch you can heat the flange where you want it to bend and give a couple gentle taps with the hammer, then heat a little further up the flange and repeat. It wants to wrap around the semicircle on one side but I did have to take a pair of needle nose pliers to get the open side of the flange to lay right. Still glowing red from the heat, this is what the strut looks like with the flanges bent. What I didn't show was using the bandsaw to trim the first flange to the centerline of the strut after is was bent around the semicircle. Then I bent the other flange until it touched the first one then used the bandsaw to get it cut so it would mate up perfect with the first one. Here they are, welded up and sanded with a belt sander. 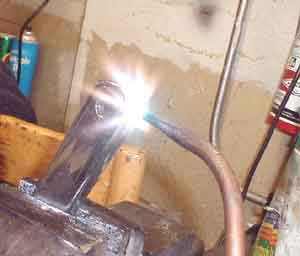 If you po folk have recovered from the melancholy of not having an oxyacetylene torch what till you realize the quality of life hit you suffer by not having a belt grinder. 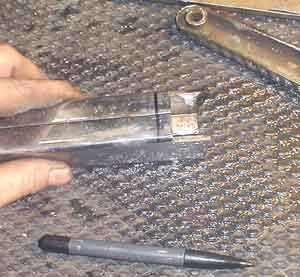 Hell with food stamp, we should have tool stamps. Teach a man to grind an you feed him for life ya know? In the mean time you can still get great results with hand-sanding. I mounted the bag with the cut-up strut in position. The luggage rack is sandwiched between the struts and bag is far enough out to miss the chain-gaurd (it's really the brake lever that's closest). The greatest thing about this is how the cut-up strut fills the gap and makes the installation more integrated. I am pointing the nice face of the cut strut inward but I will be changing that in a few pictures. Here's the bag from the side. It bugs me that the crash bar angle does not match up with the angle of the bags so..... Time to true up and form the crash bars. They had been scraped up pretty bad but here is a time honored principle: Even though they are a little rough, take the time to make them fit and mount them. There are millions (literally millions) of projects sitting in the garage waiting for the time to make new crash bars or paint this or modify that. It is far better to do something a little rough and have it done then to never get around to doing it. I heat up the corner of the bars so I can bend them a little so they match the angle of the bags. Bad move, it turns out, because someone had done the exact same thing previously. 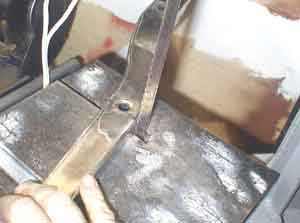 The bend had a crack in it that was filled with brazing. This melted out and left a big hole. This was important because I would use these bars as the template to make the mounts that will weld up to my cut-up struts. I needed a mount for the crash bar in the rear as well as mounting a plate that holds the bags at the bottom rear. 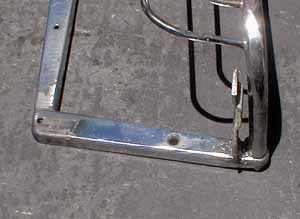 The original mount was a flat strap. I didn't want to run a plain flat strap down for this mount. So I used a bolt in this big-bike strut so I could snap the boss out. 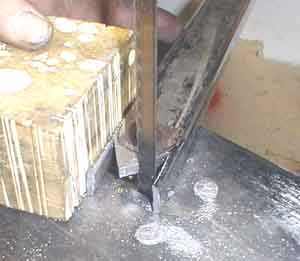 I then cut that strut up for raw material. This is going to look so good. Better yet, the strut will give side to side structure which the bags need down low. 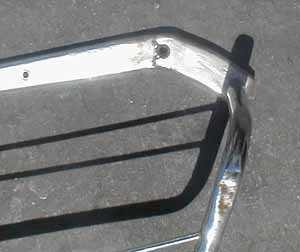 Not only that, but the big bike struts have a 3/8 hole in the end that is the exact size of the stud in the crash bars. Life is good. There was a ton of eyeballin' and cogitatin' to get the length of the strut right. 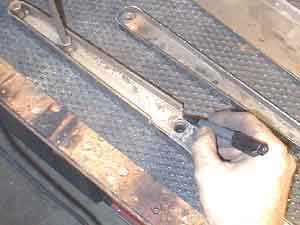 I am cutting off the flange where this strut will mate to the first struts I built. I hope your dad told you the carpenter's motto: "Measure twice, cut once, you can't make a board longer." 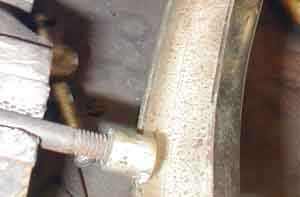 Fortunately we can weld a strut longer but why do it ? 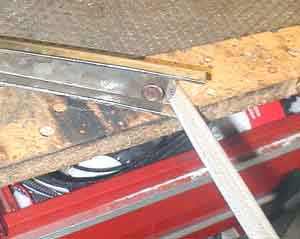 OK, I cut the flange off where the other strut will mate to it. 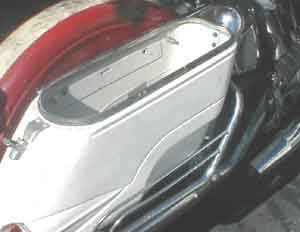 I can't remember what I was marking here so if you ever have to mount a set of Buco saddlebags to a 1962 Sportster please call me up and refresh my memory. I'm sure this is a critical operation and I think it may involve figuring out the angle this strut will mate to the original one. This is pretty straightforward. 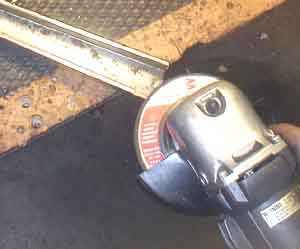 The right-angle grinder is used to get the inside face of the strut flat. This will lay up against the original strut so it must be flat. I do remember this part. This is where I convinced myself the flanges were too long for the angle they were supposed to mate at. Here I am holding both the left and right big-bike struts marked for trimming. This was a mistake. With the following pictures you can see the huge gap just about this long. Here I am clamping the big-bike strut on the left to my modified strut on the right. Having the big flat surface of the big-bike flange go over the mounting hole is comforting. 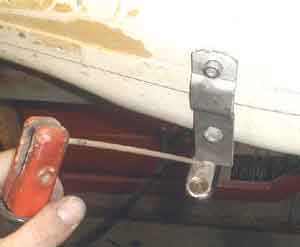 This meant it will not just be a weld that holds the struts together-- the mounting bolt will go through both so even if all the welds break the lower mount will still dangle from the bolt. 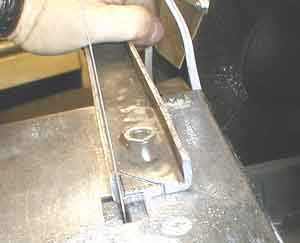 I then ran an arc weld from the edge of the flange you see to the face of the sporty strut. Before I could evaluate if the length and angle were correct I had to drill the flange of the big-bike strut where it covered the hole in the sporty strut. The sporty strut is the perfect pilot for the 5/16 drill. 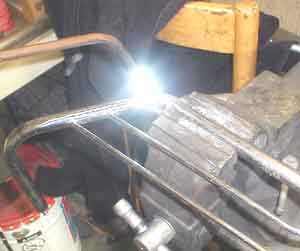 Here is the big-bike strut welded to the Sporty strut. I had to take this picture after the whole job was finished to replace a bad shot so you can see the little bracket already welded on to hold the bags at the bottom. Pretend it isn't there-- you are looking into the future. All my fretting must have paid off. The strut lined up perfectly. 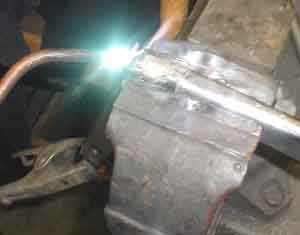 Here I am welding up all the places where I can join the two struts. 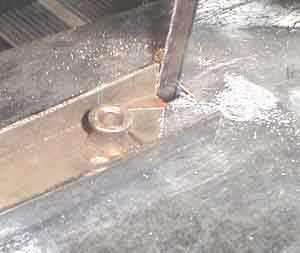 You can see the arc welder grounding clamp in the background. I arc welded most of the joints. I used the torch to weld the flanges up. When sanded on the belt sander it looks like one part. I used this part as a template for the left hand mount. I bolted the left and right struts together and welded away. 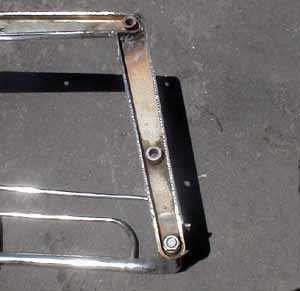 A rear view of the big-bike strut welded to the sporty strut. 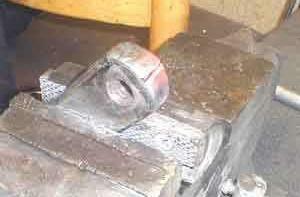 A little weld spatter but that automatic helmet that darkens when you strike the arc makes it a lot easier to weld. Those auto-darkening helmets were invented for fighter jet pilots so they would not be blinded by nuclear blasts. 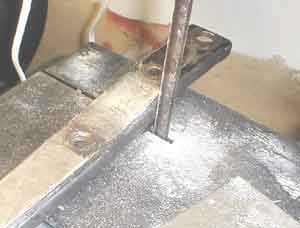 The cold war making your welding tasks easier. What about the front mount for the crash bars? Well, I had two little pieces of big bike strut left over and the flatter part you see on the far side of the bandsaw blade looked perfect for the job. Because this flange is wide I decided to cut the flanges short and bend the main web over to cap off the end. A lot more cogitatin' and measuring and I drill the hole to mount the front mount of the crash bars. You can see the flanges on the left splayed out and ready to weld to the sporty strut. The existing hole in the big bike strut was almost cut in half when we made the other piece that mounts the bags at the rear, but this partial hole lines up with the front mounting hole of the Sportster strut. 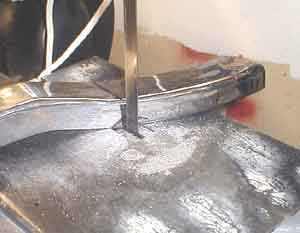 Once again, the welds can break and the part will still be attached. 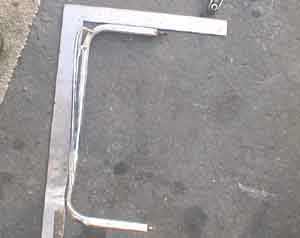 Here is the piece of big-bike strut welded to the Sporty strut. The hole is partially cut through but it is still better then nothing. 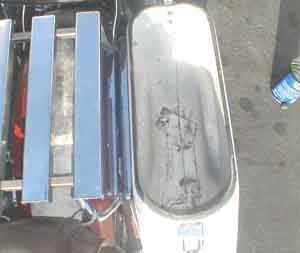 I considered welding a flat plate between the two mounting holes so the Sporty strut would press against the saddlebags the whole length of the mount but I figured it wasn't really necessary. 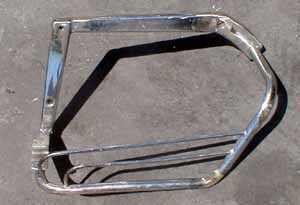 This is the big-bike strut welded to the Sporty strut from behind. I melted through the Sporty strut flange a little but no one will see since it is now on the inside. The round off the big end of the Sporty strut is covered by this new piece. 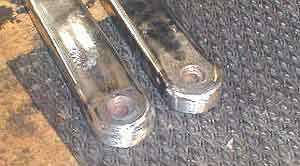 The angle of the end of the big-bike strut was cut so it would match the angle of the shocks when mounted on the bike. The final magilla with the crash bar mounted. Another shot taken after the mounts were done so the little bracket to mount the bags at the bottom rear is already on. Another look into the future. Note also that I have flipped around the way the Sporty strut mounts to the bag. At the beginning of this adventure I had the open part of the strut pressing up against the bag. When I started cogitatin' on the front crashbar mount it became evident that it would be better to have to closed side of the flange mounted towards the bags so that the big-bike pieces would both be welded onto the Sporty strut in the same fashion. It will look a little worse mounted on the bike because you will be able to see the open side of the rear big bike struts if you peer in between the bags way down low but it makes fabricating the mount a lot easier. The swicheroo was easy-- what I had intended to be the right mount was now the left one and vice versa. Then I welded on the little piece of the big bike strut in the front and the little bracket top mount the bags at the bottom rear and I was in business. The last thing was to weld up was the little bracket that holds the bags at the bottom. It had a right angle bend on it that I cut off at the right length to space the bag away from the mount. I used the bag as a template to position it. It lines up perfectly now. Tack it on with the bag in place and then pull the bag and weld it up nice on both sides. 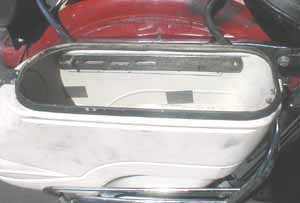 You can see the little bracket welded on the bottom rear to mount the bags. The crash bar is torn up pretty bad but I can't stress enough that it is better to get something torn up mounted and running then to let it sit in your garage for ten years while you mean to get to it. These torn up bars will serve as a great template to make a new set. Now you can put the bags into place and work the long bolts through the mounting holes. The bags are already screwed to the little bracket at the bottom. 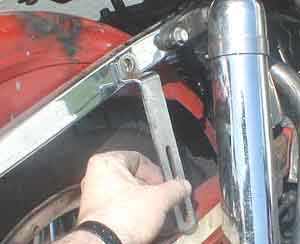 It's a little difficult but you can just get your hand behind the shock and fender to push the front bolt through. 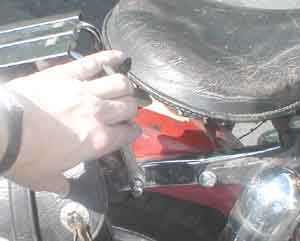 It's a little easier to run your hand up the tire from behind to push the rear bolt through. One last piece was need to support the bags from the inside. This piece came with the original mounts. It was used on the outside but hey, good steel is good steel. The fact that it was chromed was an added bonus. The hole at the left was ready to go. The peice was too long so I had to cut off a few slots on the right. 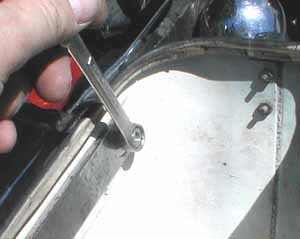 I rounded that end a little and had to file a little slot where the mounting bolt would go in the right most slot. This was so the plate won't interfere with a ridge in the bags. This is why I lamented not drilling the bags a little lower. Here the plate is flipped around and put in place. 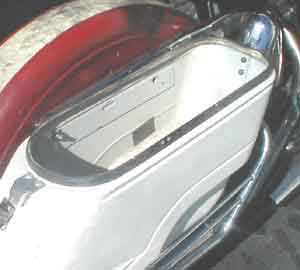 I put the hole in the front because the front hole in the saddle bags just goes through the fiberglass The rear slot is over the original riveted-in metal plate on the bags so I figured the slot would not cause problems there since the metal plate would spread the load. 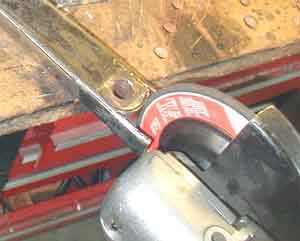 I used a longer bolt in the rear so I could use a flat-washer over the slot as well as a lock washer. I might put a jam nut on too. Having your saddlebags fall off is definitely embarrassing. Here's the bike with the bags mounted. 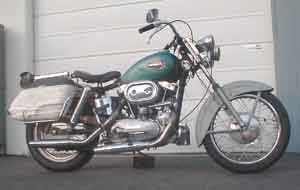 I also switched to the '59 tank and the rare valenced front fender. Yeah yeah, nothing matches color and all that noise. But you know what? I'll be driving my baby around tonight. This way I can shake out any problems right away. If the tank leaks I can fix it now without ruining the new paint. The front fender rubbed on the tire on one side. Thank god it wasn't painted while I pried on it with a crowbar. You can see the crash bar doesn't seem to match the bags on this side. 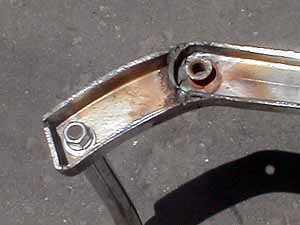 Since the left and right mounts were bolted together and matched as they were made this means the problem is in the crash bar. I needs to be straightened out and the angle changed like on the right side one. One day, for now I need to go to Albertson's and buy groceries so I can try out my new bags. This blog is copyrighted 1996-2015.